For centuries mysterious aliens have taken specimens of animals, plants and people to Isis, an earth like planet in another galaxy. It becomes urgent as global warming is ending life on earth and the supply of new specimens. Among the last of the transplants are three men and a woman who arrive together and form a bond of friendship. They begin their new lives in the struggling civilization and discover earlier arrivals have created humanoid robots to perform many tasks that would be done by real people. The most advanced humanoid is Anita, a prototype all-purpose surrogate woman. She must learn to satisfy the needs of the men of Isis. Real women are needed to populate the planet but some seek alternative ways to satisfy their sexuality. 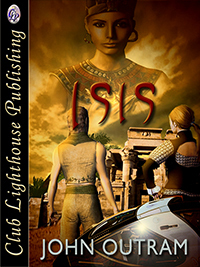 Join in the exploits and sexploits of the friends as they struggle to live on ISIS. IT STARTED WHEN A battered yellow school bus rattled down the dusty street and squealed to a stop in front of an old hotel. The door opened, a man stepped to the curb. "Go into the hotel," a metallic voice called from inside. "They will take care of you." Two other men and one woman approached timidly from the rear. "Just get out and go inside. You are expected. Hurry, I have more to do." The four strangers looked at each other blankly. "Well, I guess we'd better go in. There's no sense standing in the heat." Indeed, it was hot in the full blaze of the sun. There was no shade and no breeze to stir the air. The four walked slowly to the door where a sign informed them they were welcome to The Homestead, your home away from home. "I want to go back to my real home. I didn't book onto this trip," the woman, slim, young, with a sweet round face and long blonde hair, said. "None of us did, sweetie. We've been kidnapped by someone or something. So far no ones been hurt so we better just play along." Inside it was dark, cool. As their eyes became accustomed to the gloom it appeared to be very old and dingy. The registration desk was to the right with a lounge opposite. A tall woman wearing a smart white shirt and tie stood behind the desk. Blond and well proportioned, she called through a tight smile, "Mr. Howat". One of the men stepped forward. "Here is your room key, up one flight. You'll find everything you need in your room. Dinner is at six." "I can't pay for the room." "That won't be necessary. The Director has taken care of everything. Mr. Joyce!" Mr. Joyce received his key. "You are Miss Amano," she said looking at the blonde girl. "Yes, we know. Your room is not ready. We will send you to a bed and breakfast. You and Mr. Beauchemin will wait here for a car." She disappeared into a back office leaving the strangers alone. "I guess we'd better get acquainted. I'm Jason. Do you know where we are?" "Hello Jason. I have no idea where we are. I couldn't see anything from the bus as we came into town. They didn't give us a chance to look around when we got out of the air plane or whatever it was we were in." "Hey, you two, over here," called a voice from the lounge. "You might as well sit while you're waiting. It might be hours. Join us." They turned to a group sitting in old leather arm chairs around a battered wooden table. Jason took her by the elbow. "Let's go. Maybe they know something." "I'm George, g'day mate." A strong accent identified him as Australian. "This here is Ryan. Who're you?" "I'm Jey and this is Jason." "You just got in. You have that blank look like everyone who comes here. Where'ya from?" "I was in Alaska the last time I knew where I was," said Jason. "There were lots of people there, mostly drunk or stoned. Anyone who could was in the mountains to get cool and away from the water." "Ya, the Earth is pretty much done for. What about you, honey?" said a tall man sitting next to George. She gave him a cold look. "Jey will do, thank you. I was in California. The fires were everywhere. I couldn't see anything for the smoke and then I was on the air plane. How'd they do that?" The strangers laughed. "That wasn't an airplane, that's for sure. This isn't Earth either," said George. "What do you mean, this isn't Earth. We must be in Africa but how we got here I can't figure out," Jason said. "Naw, mate, this ain't Africa even if it's hot enough outside. I don't know where we are or why but someone said we're on a different planet and came on a flying saucer. You remember flying saucers."